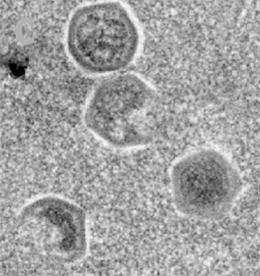 Scientists in France have isolated a new giant virus that lurks inside amoeba and whose gene pool includes genetic material from other species. After Mimivirus, Mamavirus and the virophage, the group of giant viruses now has a new member called Marseillevirus. Discovered in an amoeba by the team led by Didier Raoult at the Unité de Recherche sur les Maladies Infectieuses et Tropicales Emergentes research group (CNRS, France), a description of this new virus was published this week on the website of the Proceedings of the National Academy of Sciences (PNAS). These findings suggest the exchange of genes in amoebae that may lead to the constitution of different gene repertoires that could be a source of new pathogens. Amoebae are single-cell, eukaryote (possessing a nucleus) living organisms, some of which are human or animal parasites and may cause a variety of pathologies. Most amoebae live in water, damp soils or mosses. They are mobile and capable of ingesting a wide variety of different organisms (for example, viruses or bacteria with extraordinarily broadly ranging sizes and lifestyles). Thus amoebae provide a site for numerous exchanges of genetic material arising from the many organisms that "colonize" them. The team led by Didier Raoult at URMITE has recently discovered, in an amoeba, a member of a new family of giant viruses, which it has called the Marseillevirus, smaller than Mimivirus, which is the largest giant virus known at present. With a chimeric genome (containing both DNA and RNA) of 368,000 base pairs, Marseillevirus is indeed the fifth largest viral genome to be sequenced. It has an icosahedral shape and a diameter of about 250 nanometers (or 250 millionths of a millimeter). In addition, the researchers discovered that it contained genes from markedly differing sources, i.e. of bacterial, viral or eukaryote origin, or arising from Archae. The genome of Marseillevirus, a mosaic of genes from very different organisms, thus demonstrates the exchange of genes between the organisms that "colonize" amoebae. These studies have also revealed the role of amoebae, and more generally phagocytic protists (or single-cell eukaryotes) that feed on microbes in the environment, in the constitution of new gene "repertoires" which may be capable of generating new agents that will be pathogenic to multicellular organisms such as animals, plants or humans. "parasites on either human or animals"
This is me in my ignorance: is it common among biologists/DNA researchers to pretend that humans are a separate thing from animals? Is there a scientific and widely-accepted fundamental reason (pertaining to immune system perhaps) that human beings are classified outside of animals? Or is this simply a case of the author making a redundant statement? Last I checked, we do not fall under any of the other Kingdoms of life. He said the mechanism was not foreseen by Charles Darwin's theory that life comes from a common ancestor. "The idea of a common ancestor makes no sense in the light of viruses," he said. "That was Darwin's idea, but he was clearly wrong." Wow. This is one of the most retarded things I have EVER seen written in a biology article. Darwin's theory, and how it has been modified in the last century relate to life- virii are NOT life. The reproductive hijacking techniques of these things perfectly explain why it has code spanning multiple kingdoms. Seriously, please get real biologists for this. I expect at least an elementary understanding of biology in articles. This is me in my ignorance: is it common among biologists/DNA researchers to pretend that humans are a separate thing from animals? No. But when you publish in non-scientif circles you need to include these qualifiers since many people will think when you only write about 'parasites in animals' that this has nothing to do with humans. The idea of a common ancestor makes no sense in the light of viruses," he said. I think what he's getting at is the notion that these viruses acquire DNA from a lot of sources - which gives them no distinct ancestor from which they can be said to have evolved. It is something of a stretch to say that the existence of such things as viruses in any way shoots Darwin's ideas out of the saddle- there is no reason why ALL life has/had to evolve from a single origin- may just as well be that there is more than one lineage, or that the virus is a relict or split off from the main lineage that culminates in the suite of lifeforms in existence today. Viruses are a bit of a puzzle when it comes to the definition of life. The way I see it they show our definition of life for what it is: arbitrary and unusable except for in trivial cases. Life by definition can reproduce. A virus technically cannot. It must hijack another system that reproduces in order to make copies. I don't think even that is quite fair. They'd still have a common ancestor nonetheless, it'd just be harder to pinpoint with genetics. The new DNA the virus absorbs would simply be another method of genetic variation. Treat it the same way and I don't really see how it would be much different. Seems like the viruses pretty much remain the same, they're not really a true merging of two distinct species or anything.